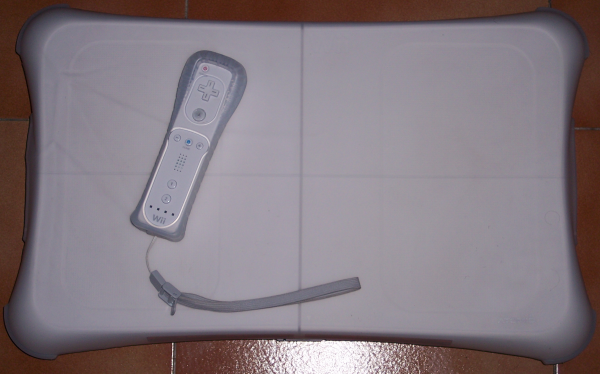 In this page I would like to share my first use impressions about the famous Wii Fit that is claimed, by Nintendo, to be a way to "bring together fitness and enjoyment at home". There are many reviews on the Internet, but most of them are based on the classic videogame style, while to correctly evaluate this product, in my humble opinion, it is needed to really use it at least for some days. - I have been in many fitness centre for many years, making practice of body building and aerobics; when I have spare time, I also practice trekking or biking. Before buying Wii Fit I scanned the Internet looking for opinions to evaluate the effectiveness of the product. As I wrote before, a review of this product is meaningful only after some days of usage; so, most of sites about videogames didn't satisfy me with their reviews. Maybe some videos found on YouTube, showing real usage, are more useful. - are exercises done with Wii Fit effective? Is there a risk that doing exercises at home all alone, without any control by someone else, has not really good effects on body? - is it possible to do exercises for all parts of body? A common problem of exercising at home is that some muscular groups are difficult to train (e.g. dorsal muscles). - is it a problem tu use it when there are other people sleeping at home (e.g early in the morning)? Is it possible to shut up the TV set? - is there enough room in my living room? - I read somewhere that this software evaluates physical condition through the Body Mass Index, that relates height to weight, but I don't believe this simple parameter to be suitable. - will it get dirty? Is a cover needed for the Balance Board? A short story about the search for the product. I choose to buy it on July 2008 but I had big problems to find one: it was unavailable in 4 big electronics stores in Rome and on many online shops. At last I could find one out of Rome. At the moment it costs between 85 and 90 euros. The big package contains the so called "Wii Balance Board", the game disc and instructions manuals. The Balance Board looks like a common scale, maybe a bit wider, powered by 4 AA batteries included in the package. Installation is quite simple and well guided by manual. You need only to insert batteries in their place, put the Board in place in front of TV and pair it with the Wii console through the synchronization procedure. Then, on the first run, you need to set up your character, insert some data like your height, date of birth, etc. Then you need to choose your trainer between a man or a woman. The following step it the evaluation of your Body Mass Index; in the meanwhile the software gives some advices about healty life styles. You also need to estabilish a target weight: it sounds a good thing that the program says what is the maximum weight per week it is advisable to lose to prevent causing damages to your body. Interface is friendly; you are guided by an animated Balance Board that talks and explains the meaning of each choice. At the beginning, for each category, only a subset of exercises is available; others are made available only after some training. You choose all alone each exercise among all those available. Yoga. At first, yoga was quite boring since before each exercise I had to watch all tutorials that trainer provided to explain how to practice it. When doing yoga, the Balance Board monitors continuosly your balance; it is evaluated for the final score. During the exercise you are also adviced if you are moving too much. At the end of each activity the total time is showed; from time to time, after going through some thresholds, new exercises are unblocked in one of the four categories. Some exercises need you to stretch out arms or legs: it is in this moment that the need for some free space around the Bord arises. Muscular training. Also in this category you should watch for a tutorial before each exercise. Before each exercise a picture of the human body, with the trained muscles, is showed on screen. Some examples of exercises are: leg back estension (gluteus) or lateral extension, push up with hands on the Balance Board, abdominal crunch. Very soon I began to understand that it was advisable to buy a gum cover for the board, to avoid slipping due to sweating. Then, since it is sometimes needed to lay behind the board, it is needed a couple of meters of free space, and a gym carpet, possibly with a bath towel. For each muscular exercise that you finish, a paired yoga exercise is suggested. Here comes a bad characteristic: not all the possible wrong moves are stressed enough. - Hula Hoop: very funny even if tiring; you step on the Board and rotate your hips while your character makes the hula hoop rotate round and round. From time to time a new hula hoop is thrown and you can catch it shifting your weight towards the direction it is coming from. - Step dance: you have to step on top of the Board and back on the floor following the rythm of music and reproducing the steps as shown on the screen; together with you, other guys dance in row on the stage in front of the public composed by many people jumping and clapping hands. - Balance Bubble: your character is suspended in a soap ball floating on a river and you drive it avoiding bees, rocks and other obstacles shifting your weight to accelerate, brake or go left or right. First conclusions. My first impression is quite good, even if it took a lot of time to watch a tutorial for every exercise. It is evident that it is not possible to create a "program" for each day of training (something that is quite common in every fitness center): you need to choose, one after the other, each exercise. Tomorrow I will begin with some warming exercises such as jogging and other aerobics; then, I'll continue with muscular exercises, then yoga and finally balance games. At the end of each exercise a score is showed that is recorded in a "best scores" list. When accumulating exercise time, new activities are unblocked together with harder versions of the already unblocked ones. For example, at the beginning the 5 mins jogging version is only available; then, the 10 mins is unblocked. Today the body test went quite better: my Wii Fit age dropped under the real one. As planned, I started with some warming aerobics activities, then I continued with muscular exercises and yoga. I skipped the push-ups since my triceps are still aching from yesterday. At the end of muscular activities Wii Fit proposes some yoga exercises: this is the only case of exercises suggested by the game. At the end, I relaxed with some balance games, the most pleasing. One of the objectives frequently stated by the game is developing the sense of balance and of simmetry of the body, maybe more that increasing muscular mass. I keep doing more or less the same sequence of exercises. More and more are unblocked in all four categories. Balance games are really funny, even if I'm afraid that in the long run the will become quite repetitive; in fact, in each one, paths and tactics are always the same. During execution, particularly for muscular ones, it would have been advisable the trainer to stress more and more the importance of good posture giving the classic advices that we all hear in the fitness centers: contract abdomens and glutei, avoid bending back, etc. Anyway it warns you if detects, through the Board, that you are not doing well: for example I'm often warned to reduce movements of my barycenter controlling abdomen and back. From time to time, spontaneously, the game gives advices about nutrition, nightly sleep and on how to find the origins of weight rise. At the beginning, I had the sensation that dead times were quite long, but, using a clock, I could verify that in 1 hour and 10 minutes I did 50 minutes of effective work (measured by the game), that is comparable with what happens in fitness center during training with weigths. In the comparison with one hour with an aerobics trainer, Wii Fit looks quite less efficient. There is another characteristic really evident: the Balance Board gives a feeling of high robustness; it seems able to tolerate all thrusts it receives during playing. These thoughts come after some days of usage and could be updated in the future. At the beginning I must say that it is not possible to transfer home neither a fitness center, nor a run in the open air or a run on the bike. Anyway, Wii Fit gives a good help to do some physical training without going out. During muscular and yoga exercises, it gives advices for the accurate execution of moves, but your control over your body remains essential. You are also asked to choose your exercises all alone. Activities are quite diversified and let you train several parts of your body, keeping an eye on the control of your balance. It is important to have enough room all around the board: I suggest 1.5 meters on both sides and 2 meters behind. I also suggest buying the gum cover. Everything is made more pleasant with a gaming atmosphere of challenge that helps to stimulate improvements to reach always better results. Balance games are really funny even if a bit short. For the moment being, I still have doubts about the effectiveness of exercises done in this way, for calories consumption or for muscular mass development. Anyway, it is sure that the day after training muscles feel tired, so some effect is granted. These comments come after three weeks of training. I used Wii Fit from Monday to Thursday, while in the weekend I rode my bike. Impressions that I described above are more or less confirmed. Maybe I have, now, more confidence in the effetcs of the training. In fact, with the progress in all activities, harder versions of exercises are unblocked , and the day after training I feel tired just as I did when I used to go to the training center. The longest versions of aerobics exercises make me sweat very much. In addition, the final score of each activitiy, pushes towards higher results and, together with the variety of exercises, prevents it getting boring. Some muscular group is excluded, like biceps or dorsal muscles.